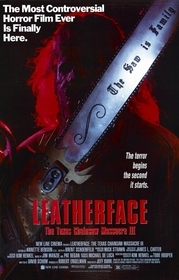 As is apparent in the structuring of its title, Leatherface: Texas Chainsaw Massacre III is more concerned with building a franchise out of its titular villain than it is crafting a continuous chapter in Chainsaw lore, and the resulting film struggles to find balance between being both a remake and a sequel to Tobe Hooper's original1. Admirers of the first film will have no trouble spotting the twists and turns of David Schow's script, which treats Hooper's original screenplay like a road map, stopping at all the familiar spots along the way to a dissatisfying conclusion. To his credit, director Jeff Burr tries to inject his been-there-killed-that film with copious gore expected of a movie with Texas Chainsaw Massacre in its title (ironic since the original film had little red stuff to show), but New Line Cinema's vigorous cuts prevent the film even from being enjoyed on a primitive level. What's left is a gutted, castrated version of the original Texas Chain Saw Massacre. It all starts with a road trip. Michelle (Kate Hodge) and Ryan (William Butler) are traveling from California to Florida to return Michelle's dad's car to him. Somewhere in the most desolate (and isolated) part of Texas, the two teenagers stop at the Last Chance Gas Station and meet Tex (Viggo Mortensen), a nice enough cowboy-type that offers directions, and the nefarious gas station owner Alfredo (Tom Everett), who, like most movie gas station attendants, looks like he lives there. Wouldn't you know it that Tex's directions lead the teens right into a meeting with a psychopathic family of cannibals that includes a chainsaw-wielding killer named Leatherface (R.A. Mihailoff)? Luckily for Michelle and Ryan, there's also a stranded survivalist named Benny (Ken Foree) and an escaped Leatherface captive, Sara (Toni Hudson) to assist the heroes throughout this hellish road trip. Will they make it out alive? Who will be left and what will be left of them? Oh sorry, wrong movie. Forgive the spot of sarcasm but Leatherface does little to distinguish itself from its source material in terms of plot points. There's the familiar text scroll that opens the film, the upfront road trip aspect, the fateful trip to a gas station, the meeting of a stranger that turns out to be part of the villainous troop, the capturing of the teens, and even a dinner sequence in which the family wants to "feed" their decaying grandfather, complete with eardrum-shattering scream from the film's heroine. Suspense is lost in the familiarity of the scenes; when a helpful tow-truck driver comes along after Michelle and Ryan get a flat tire, the reveal of the driver's nihilistic intentions loses its shock value since the character so closely mirrors the gas station owner that offers to help Sally in the original film. It becomes an unspoken rule of the film not to trust those characters that are better off than the two teenage heroes since that's how it worked the first time around. Once that expectation hits, the tension of who to trust and who not to trust dissipates. His audience's hearts not racing, Burr opts to churn their stomachs instead, aiming for an even bloodier film than The Texas Chainsaw Massacre 2 (which went to theaters unrated). Though Leatherface went through theaters with an R rating, the DVD release includes an unrated version as well, but neither film appears to be the one Burr wanted to make. Watching the documentary "The Saw is Family: Making Leatherface" (included as a special feature on the DVD), it's obvious that Burr's original vision was much nastier than either of the cuts released. 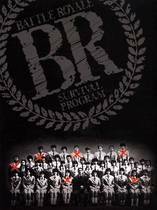 I watched the unrated version for the sake of this review but it's worth watching the making-of documentary to see the kind of insidious cuts that needed to be made just to get the film from its original X rating to an R. One such example is a scene in which a little girl releases a spring-loaded sledgehammer into a helpless victim; evidently the MPAA had a problem with a single shot of the little girl's hand releasing the lever. That shot is restored in the unrated cut, but nevertheless the MPAA and studio's presence can be felt as cutaways often leave particularly gory scenes unfinished and disjointed. Yet none of the studio's cuts made during the film's post-production are as a detrimental as the poorly tacked-on happy ending, a conclusion so completely devoid of logic that it's a wonder it made it into the final product. Those that do not wish to have the ending spoiled should feel free to skip to the next paragraph and miss out on a good laugh. During the conclusion of the film, Leatherface and Benny are going mano-a-mano in a nearby bog with a clearly unmanned and partially submerged chainsaw still running in the water (?! ), and Benny meets his tragic demise when he is pushed head-first into the whirling blade of death. You would think that a severed head would severely impact a character's ability to continue to be a factor in a film, but no more than a few minutes later it is Benny that shows up in a pickup truck to save Michelle just in the nick of time and the two drive off into the sunset. Even funnier than that image is the fact that Benny is wearing a band-aid on his forehead, most likely to keep his brains from spilling out. The film's closing image of Leatherface watching the escaping heroes is rife with sequel aspirations on the part of New Line Cinema, but the film does little to warrant another go-round with the character. Though the opening sequence of the film-which shows Leatherface sewing together one his infamous skin-masks-shows signs of exploring the character through his psychotic rituals, the potential soon dissipates. One unnecessary scene has Leatherface sitting alone in the basement pushing buttons on a Speak-and-Spell-like mechanism; any child-like quality we're supposed to pull out of the scene is negated by the fact that he's constantly spelling "F-O-O-D" when shown a rudimentary diagram of a person. Not to mention the scene goes on far too long with Leatherface spelling the same word multiple times over. That time could have been better spent explaining the relationship he has with a little girl that lives with his family, who refer to her as Leatherface's "daughter." The hows and whys of that situation are just begging to be explored. Leatherface: Texas Chainsaw Massacre III is one of those could-have-been-should-have-been films: though it could have been a worthwhile sequel to the original, its plot follows so closely that it's more of a disparaging remake, and while it should have been the start of a Texas Chainsaw Massacre franchise, the film pales in comparison to its successors in terms of gore and finding a use for its primary villain. But what is most disappointing about Leatherface is that we will never be privileged to seeing the film as Burr originally intended. The New Line Cinema DVD promotes the movie as "The Most Controversial Horror Movie Ever Made." It should be changed to "The Most Controversial Horror Movie Never Made" instead. 1 Leatherface: Texas Chainsaw Massacre III does not recognize The Texas Chainsaw Massacre 2 as a sequel to the original film, probably because the ending of TCM2 completely negates the existence of this film. Submitted by Nate Yapp on Tue, 2010-10-12 14:00. Great review of a somewhat disappointing film, John. I think I enjoyed it slightly more than you did (partially because I was doing mental acrobatics trying to fit this new family into the Sawyer family tree), but it could have been much much better.